Is it Time Again to Time Stocks Again? Is it time to time stocks? When the Dow Jones industrial is at or near an all time high is it time to do some market timing? The Dow is at an all time high and is enjoying its longest bull trend… ever. Should we get out of markets altogether or swap US shares for equities in better value markets? Certainly one wants to seek good value, but decisions should not be made on market timing whenever possible. I have been reminded of this in the annual “Risk & Return Characteristics of Selected Asset Classes” review by Keppler Asset Management. This review gives us “Key Considerations for Asset Allocation Decisions”. This advice reminds me of a Keppler Asst Management once a year review of the “Risk & Return Characteristics of Selected Asset Classes”. 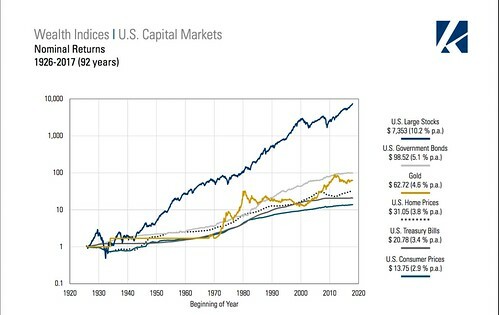 The chart below from this 2018 review shows that large US stocks certainly outperformed US bonds, gold and housing in the long term. 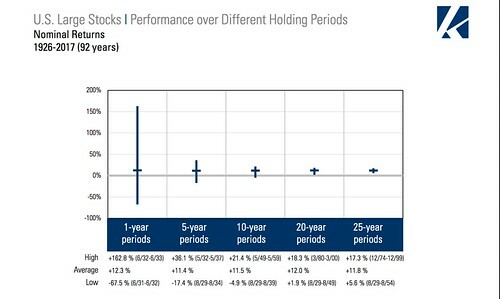 This study also shows that short term decisions about these stocks have the highest risk and that statistically have a risk of loss of up to -67% if the decision is held for only one year. Time is the key. Stocks dramatically outperform all other forms of investment in this study, but a global index of stocks are the riskiest investments and have the greatest potential for loss if held for less than ten years. The following chart shows how great the risk is on year one. Equities offer the highest potential return. Equities also offer the greatest risk in the short term. 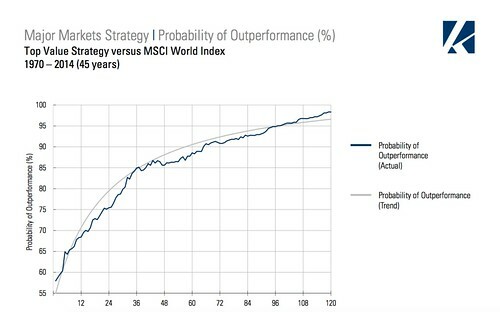 If one can invest with a ten year horizon… the study suggests that there is almost no risk and a guarantee of the best return. You can see this clearly in the next chart. There is a 25% chance of loss in the first year, but only an 9% chance of loss with bonds and a 3% chance of loss with T-Bills. In a five year horizon there is no chance of loss with US bonds or T Bills but still a 13% chance of loss with equities. 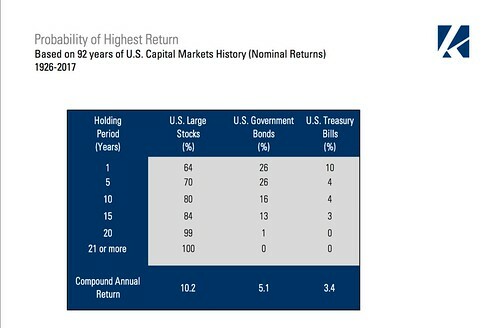 We can see similar ratios if we wait for the highest return in stocks, bonds or T Bills. 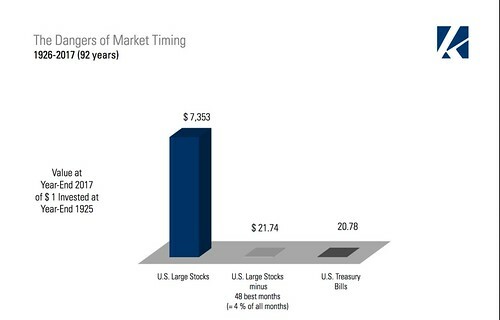 Using time, instead of market timing makes sense as the chart below shows. This study can be enormously helpful in determining how to structure your savings. First, let’s look at what to take into account. 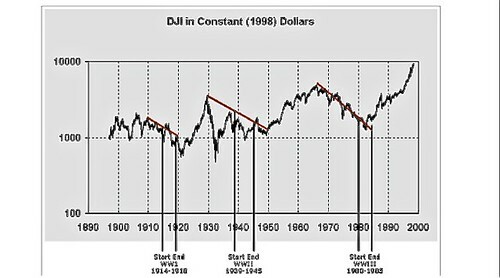 This is a study relating to large US stocks, bonds and T-Bills over the past 87 years. US Debt, growth and risk characteristics will differ in the next 87 years. This study is a guide to understanding how time changes the risk reward relationships of stock versus bonds and T Bill investments in an economy with characteristics similar to US over the past 87 years. Second, take into account how much time your investments have until redemptions are required. If you know that you’ll need to liquidate within a year, can you afford to absorb as much as a 67% loss? Third, take into account the type of redemptions… are they big chunks to pay off mortgages or pay for university fees, etc. or smaller monthly chunks to provide income. Fourth, take into account how much you can afford to lose. Will a small loss throw your budget into turmoil or if you lose half of your capital will you still be okay? Fifth, do you have enough to layer your investments so bond investments can provide short term withdrawal requirement and equity investments can be left alone for more than five and ideally up to ten years? The stock market has always been the best place of places to protect and increase wealth over the long haul. Yet it’s also been the worst place to lose money, a lot of it, quickly. The goal of investing should be to stabilize our security, bring feelings of comfort and elimination of stress! We should not invest for fun, excitement or to get rich quickly. We should not divest in a panic due to market corrections. This is why my core stock portfolio consists of 19 shares and this position has hardly changed in three years. During this time we have been steadily accumulating the same 19 shares and have traded only twice. This portfolio is built around a strategy that’s taught in my Purposeful Investing Course (Pi). I call these shares my Pifolio. This portfolio more or less matched the S&P 500 until May 2018. Then a stronger US dollar made the portfolio look like it was falling behind. This currency illusion creates a special opportunity we’ll view in a moment. This portfolio above is based on stock price to value analysis built around 91 years of stock market data. The value analysis is used to create a portfolio of MSCI Country Benchmark Index ETFs that cover stock markets that are undervalued. 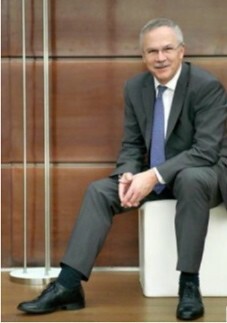 I have combined my 50 years of investing experience with the study of the mathematical market value analysis of Michael Keppler, CEO of Keppler Asset Management. In my opinion, Keppler is one of the best market statisticians in the world. Numerous very large fund managers use his analysis to manage over $2.5 billion of funds. However because Keppler’s roots are in Germany (though he lives and operates from New York) and most of his funds registered for the European Union, Americans cannot normally access his data. I was lucky to have crossed paths with Michael about 25 years ago, so I am one of the few Americans who receive this data and you will not find his information readily available in the US. In a moment you’ll see how to remedy this fact. The Pifolio analysis begins with Keppler’s research that continually monitors 46 stock markets and compares their value based on current book to price, cash flow to price, earnings to price, average dividend yield, return on equity and cash flow return. Then Keppler takes market’s history into account. Michael’s analysis is rational, mathematical and does not cause worry about short term ups and downs. Keppler’s strategy is to diversify into an equally weighted portfolio of the MSCI Indices of each good value (BUY) market. A BUY rating for an index does NOT imply that any one stock in that country is an attractive investment. This eliminates the need for hours of research aimed at picking specific shares. It is not appropriate or enough to instruct a stockbroker to simply select stocks in the BUY rated countries. Investing in the index is like investing in all the shares in the index. You save time because all you have to do is invest in the ETF to gain the profit potential of the entire market. Here is the Pifolio I personally held at the beginning of 2019. 70% is diversified into Keppler’s good value (BUY rated) developed markets: Australia, France, Germany, Hong Kong, Italy, Japan, Norway, Singapore, Spain and the United Kingdom. iShares Country ETFs make it easy to invest in each of the MSCI indicies of the good value BUY markets. There is an iShares country ETF for every market. How you can create your own good value strategy. 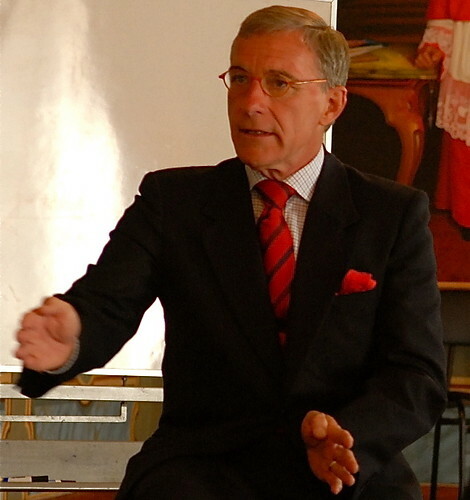 I would like to send you, on a no risk basis, a 130 page basic training course that teaches the good value strategy I use. I call this strategy Purposeful Investing (PI). You learn all the Pi strategies, what they are, how to use them and what each can do for you, your lifestyle and investing. You get this course when you enroll in our Purposeful Investing program (Pi) with a triple guarantee. Enroll in Pi. Get the 130 page basic training, a 46 stock market value report, access to all the updates I have sent in the past three years, two more reports on investing (described below) and an online Value Investing Seminar right away. 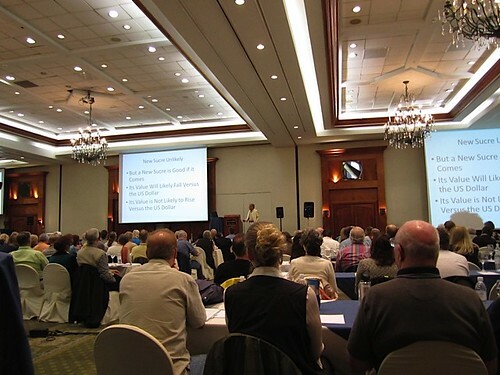 Subscribe to Pi now, get the 130 page basic training, the 118 page 46 market value analysis, access to over 100 previous Pifolio updates, the “Silver Dip 2019” and “Three Currency Patterns For 50% Profits or More” reports, and value investment seminar, plus begin receiving regular Pi updates throughout the year. Subscribe to a Pi annual subscription for $99 and receive all the above. You also begin receiving regular emailed Keppler analysis and online access to all that analysis of the last three years. Each update examines the current activity in Pi, how it is changing, why and how the changes might help your investing or not. Included in the basic training is an additional 118 page PDF value analysis of 46 stock markets (23 developed markets and 23 emerging stock markets). This analysis looks at the price to book, price to earnings, average yield and much more covering thousands of shares. This is one of two reason why my Pifolio lagged behind the S&P 500 from May 2018. The US dollar has become overly strong. This is the most exciting opportunity I have seen since we started sending our reports on international investing ideas more than three decades ago. The strong dollar gives non US shares extra profit potential. The trends are so clear that I have created a short, but powerful report “Three Currency Patterns for 50% Profits or More.” This report shows how to earn an extra 50% from currency shifts with even small investments. I kept the report short and simple, but included links to 153 pages of Good Value Stock Market research and Asset Allocation Analysis. Enroll in Pi. Get the 130 page basic training, a 46 stock market value report, access to all the updates I have sent in the past three years, two more reports on investing (described below) and an online Value Investing Seminar right away. Subscribe to a Pi annual subscription for $99 and receive all the above. Overseas, value investing is really a bargain following a dismal year in 2018. It’s no secret that value-based equities in the United States and overseas have lagged their growth cousins since 2009. It’s unusual for value to lag growth this long (see above chart). Why has value so badly trailed growth in this cycle? Investors have embraced growth because of accelerated earnings and growing revenues in sectors of the market that continue to lead the charge in this bull market: technology. Recent declines in tech shares suggests that we’ll soon see a return to value. Plus get the $39.95 report “The Silver Dip 2019” free. I have updated this report and added how to use the Dip Strategy with platinum. The “Silver Dip 2019” report shares the latest in a series of long term lessons gained through 40 years of speculating and investing in precious metals. I released the 2015 report, when the gold silver ratio slipped to 80. The ratio has corrected and that profit has been taken and now a new precious metals dip has emerged. I have prepared a new special report “Silver Dip 2019” about a leveraged speculation that can increase the returns in a safe portfolio by as much as eight times. In 2018 I celebrated my 50th year of writing about global investing. Our reports and seminars have helped readers have better lives, with less stress yet make fortunes during up and down markets for decades. This information is invaluable to investors large and small because even small amounts can easily be invested in the good value shares we cover in our seminar. Subscribe to the first year of The Personal investing Course (Pi). The annual fee is $99, but to introduce you to this online, course that is based on real time investing, I am including FREE the $29.95 report “Three Currency Patterns for 50% Profits or More”, the $39.95 report “Silver Dip 2019” and our latest $297 online seminar for a total savings of $366.90. On other bit in the bargain is that after the first year, you will continue to receive the market analysis but for only $39 a year. You can cancel at any time, but for just over $3 a month you’ll receive all my updates on global investing.